These are two words that seem to wind up in almost every description of India, and rightfully so, as during the two and a half years that I’ve now spent traveling around the subcontinent, I’ve only experienced a small handful of moments that could be described as anything close to peaceful. But of course that’s the allure of India and without that chaos and intensity, an adventure to this country simply wouldn’t be as life-changing as is normally the case. However, on the other hand, India also wouldn’t be India without the constant surprises that she so consistently throws in the path of every traveler who dares to venture inside its borders. Back in 2007, moments before boarding a flight from JFK airport in New York City to Mumbai for my 7th visit to India, I received a text message from a friend. Fourteen hours later I arrived in Mumbai, where I met up with two other friends with whom I planned to travel for a month. And during that first evening together, we realized that, apart from spending a few days in Mumbai, we had no idea where else we would visit. This is most likely why nobody objected when I randomly suggested we travel to Bundi, which, apart from the text message I had received, I had never heard of. In fact, none of us had heard of Bundi in India before and none of us even knew where it was located within this vast country. But two days later, after doing a quick five minutes of research about Bundi on the internet, we boarded the Firozpur-Janata Express at Mumbai’s insanely crowded Mumbai Central train station. We were bound for Kota, the closest transportation hub to Bundi, which we now knew was situated on the eastern edge of the culturally-rich state of Rajasthan. Nineteen hours later we arrived. To put it simply, we ended up spending 10 days in Bundi, finding it harder and harder to leave as the days passed. It took barely an hour for us all to become far too captivated by Bundi’s unlike-any-other-place-in-India charm to even consider heading somewhere else. Chaotic and intense do not apply in this town, with words such as tranquil, laid-back, enchanting and extraordinary much more appropriate instead. From almost any vantage point, the impressive Bundi Palace looms overhead from its location halfway up the hill, representing one of the most well-preserved palaces I’d ever seen in India. Glance even further towards the sky and your eyes will meet the grand Taragarh Fortress, whose ancient outer walls line the entire summit of the hill, encompassing various hilltop shrines that are still used by locals to make daily offerings to the Hindu gods. Glance even further towards the sky and your eyes will meet the grand Taragarh Fortress, whose ancient outer walls line the entire summit of the hill, encompassing various hilltop shrines that are still used by locals to make daily offerings to the Hindu gods. A short 30-minute walk up the hill brings you straight to the fortress, where one can climb onto the top of the fortress wall. From here, the never-ending view is addicting, especially before sunset when the colorful town below appears as majestic as those found in the wildest of fairy-tales. 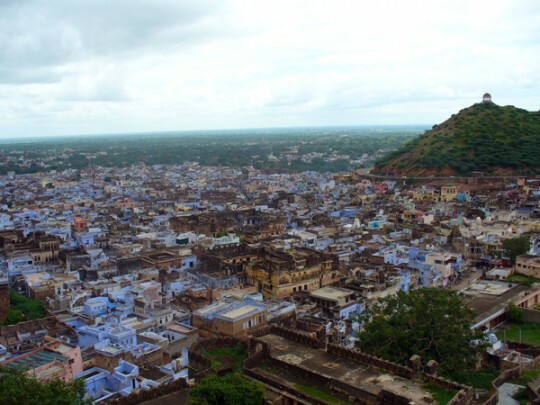 Bundi’s population, which consists of an interesting mix of Hindus, Muslims and Jains, all of whom live in complete harmony, are clearly proud of the peaceful atmosphere they’ve created. Smiling locals, many of whom extend their hand in greeting to all strangers who pass them by, are the norm and two minutes will rarely pass without a group of children leading you off for a personal tour of their neighborhood. Incredibly, the usual fears associated with traveling in India – pickpockets, being ripped off, endless scams – are nothing to worry about at all here. The biggest problem travelers face in Bundi is the potential lack of sleep due to being invited to participate in one of the frequent, all-night religious ceremonies that take place in the streets. And if you tire from all of the celebrations, chances are you’ll have a cheerful room to return to as Bundi offers a small, but sufficient variety of excellent budget accommodation, typically in buildings full of history and character. As a result, it’s quite easy to understand why the handful of other travelers I met during my visit all ended up re-arranging their itineraries in order to accommodate a much longer stay in Bundi than they had originally planned. One morning, a few days into our stay, my friends and I decided to test the surrounding area, to see if the countryside beyond Bundi had a similar, serene feel to it. We hired a rickshaw for the day, paying 300 rupees ($7 USD) to a driver who we somehow convinced to hand us his keys and stay at home while we drove his rickshaw, even though none of us had ever driven a rickshaw at any point in our lives. Sure, we ended up having to pull ourselves out of small roadside ditches on a few occasions and we were nearly run over by the occasional truck or camel cart, but apart from those minor challenges, we ended up discovering a region of India that not only lived up to the high expectations set by Bundi, but that very few travelers have a chance to explore. From the kindest, most generous local villagers (especially this tea stall owner in the photo whom I will never forget) to the ever-changing landscape of sparkling lakes, stretches of desert, lush forest and impressive karst formations, we found ourselves increasingly enthralled by the region with every passing kilometer. After nine hours of exploring, we eventually returned to Bundi, barely able to contain our excitement over the day’s excursion. And that night, during dinner at a local rooftop restaurant, the three of us began contemplating whether or not we should move to Bundi for good. Of course, that was mostly talk, but we carried on eating our meals, drinking our beers and talking about Bundi well into the night, barely even noticing the frequent power outages that darkened this sleepy community. I simply didn’t want to leave that rooftop, as any time that I find myself sitting in the middle of a peaceful town built for royalty, at the foot of a palace, under the protection of a fortress and surrounded by the golden desert, I am as happy a traveler as can be. And the fact that this location was in the middle of chaotic and intense India made my experience here even more rewarding. A 5 minute ride is more than sufficient! Wow Earl, that description and statement coming from someone who has been to India 7 times is powerful. I think Bundi is a must! 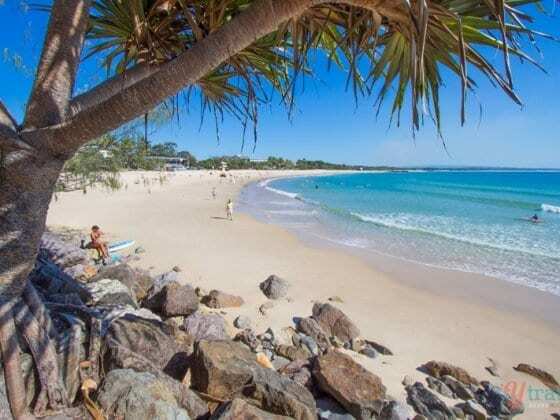 It sounds so relaxing and tranquil in the midst of a busy country – I’ll hopefully visit this year! Hey Mark – Bundi is still my favorite place in India and I’ve now been 9 times to that country 🙂 You should definitely try and make it to Bundi. The good thing is that it is semi-conveniently located (near Delhi and Agra), which is a lot more convenient than most places in India. I am from bundi Rajasthan.. 🙂 i didnot fill till now that how many things i did not do in bundi..
India has many interesting towns if you get off the usual paths. Thanks Earl. Great to see this place highlighted. Hey Jim – You said it perfectly. India is one country where a traveler does not need a set itinerary. All you need to do is jump on a bus or train, get off in any random town, village or city and you’ll end up having an interesting adventure! It’s almost impossible not to find or see something interesting in that country no matter where you go. Interesting take on Bundi, especially how you mentioned that travelers having a lack of sleep due to the ongoing festivals and celebrations. Sounds like one of those places you see in the Bollywood movies. Hey David – One of the first nights I was in Bundi I was woken up at 1am due to some drum playing taking place nearby. After two hours I had to go and see what was going on and sure enough, in a small Hindu shrine located at a fork in the road were five guys playing their tablas. And then came the parade, with hundreds of people playing instruments and singing and dancing….at 3:30am. The next night, it happened all over again and the only explanation I got from the locals was that there are always festivals taking place in Bundi. And they always seem to be in the middle of the night! I wish I knew about Bundi when I went to India. Guess I’ll have to go back now! I can’t believe a rickshaw driver let you drive yourselves around! It’s scary enough sitting in the rickshaw by the other vehicles, I couldn’t imagine driving it, cool story. Hey Katie – Trust me, we were quite shocked that the guy gave us his rickshaw as well. And in the end, my friends and I were wishing we had brought the driver along as driving one of those things is fun for about the first 4 minutes. After that it’s only hard work and complete test of one’s nerves! I haven’t been to Bundi, but I understand your enthusiasm about India, I’ve been only once and can’t get it off my mind. Next I’ll go to the Himalayas, afterwards, it would probably be Bundi! Great reading this Earl. I’m planning out India right now and debating whether I should stop by Jodhpur or Bundi. We have less than 3 weeks and planning to do the Golden triangle, Varanasi, and Rajasthan. Time is limited, so this is going to be hard to pick. I’m considering to drop Jaipur as well considering people I talk to don’t like it much. Thanks for the great article about Bundi. I am always looking for out of the way places and I am actually heading there tomorrow largely based on this recommendation. After more than fifteen visits to India I am content to make Bundi my sole destination. 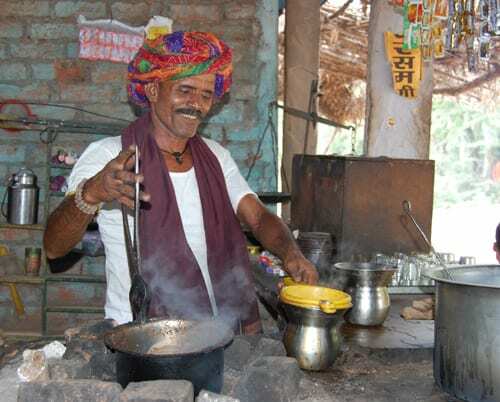 Great post, Earl, and I will keep Bundi in mind for my next visit to India. It sounds magnificent. I also recognise your first words and lines, about chaotic and intense and barely ever feeling moments of peace;-). I remember reading this post a couple of years ago, and as I’m considering going to India later this year, it popped into mind. Sounds like a wonderful place. I love big, chaotic cities, but need somewhere a little calmer every once in a while. Great post, and one that’s stuck with me! Amazing Caz. I have traveled to Bundi many times. And I plan to keep travelling more and more to this town as it has many things to offer. I am glad you liked this town and India. You just made my day! Such a lovely article about my hometown. I have met a lot of travelers in Bundi and many of them have praised and commented that its best so far but this article really talks much more & beyond it. I am glad you liked our town and spent your 10 days in Bundi. I am presently working on making a website, http://www.incrediblebundi.com to put all the information at 1 place to help tourists to discover Bundi in much better way. I read the whole article about Bundi. It was very enjoyable. This is Sumit Agarwal from Kota, Rajasthan, Yes i am from Kota, a place which is 28 KMS far from Bundi and a olace which is an entrance for Bundi. Currently i am working in Redington- CISCO, Mumbai, Maharashtra. Please let me know if you need any kind of Support or help. Once again thanks for this lovely article. BUNDI FORT is amazing in rajasthan. when you overlook this fort its just great to look complete city. i have visited 2 times and every time i feel so cool. Nice to explain in detail and behind the place ,Its rare to get info like this behind each place. Picture collection is very beautiful. After reading your article, I was inspired to visit Bundi and loved my one-day trip to this quaint little place. Each and every word is so true! That was indeed a great post Caz, you just motivated me to visit Bundi. Loved how you pictured it, particularly the part where you mentioned that this is such a happening place that travelers don’t get a time to sleep due to the ongoing festivals and celebrations. Great story. Yet another lively and cool travel tale shared by Earl. It must be fun driving the rickshaw. 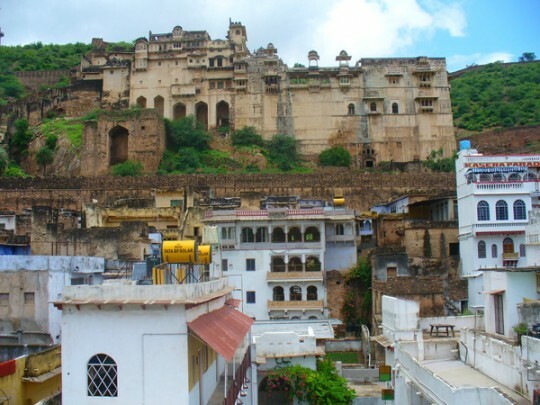 Your post has inspired me to visit Bundi as soon as possible.Thanks for such a great article ! !